When families have members in the same line of business, it’s natural to compare and rank them, sometimes unfairly. Despite his success, Eli will always be the “Lesser Manning;” due to his lack of success, Daniel will always be the “Lesser Baldwin;” and Zeppo will always be the standard-bearer as the “Lesser Marx.” This is especially inevitable when one family member excels in the spotlight, like Peyton, Alec, and Groucho. The Samuels family is one of Kentucky Bourbon’s Royal Families, with commercial distilling beginning with Taylor William “T.W.” Samuels in 1840, and farm-distilling before then, as early as 1783. The Samuels line of commercial distillers is unbroken through six generations: T.W. Samuels (1821-1898), William I. Samuels (1845-1898), Leslie B. Samuels (1871-1936); Taylor William Samuels, IV (“Bill, Sr.”) (1911-1992), Taylor William Samuels, V (“Bill, Jr.”), and Rob Samuels, even though Prohibition and breaking off to form Maker’s Mark both resulted in some down-time. According to the National Register of Historic Places application for the T.W. Samuels Historic District, T.W. Samuels had a younger cousin in the business, W.B. Samuels. W.B. Samuels started the W.B. 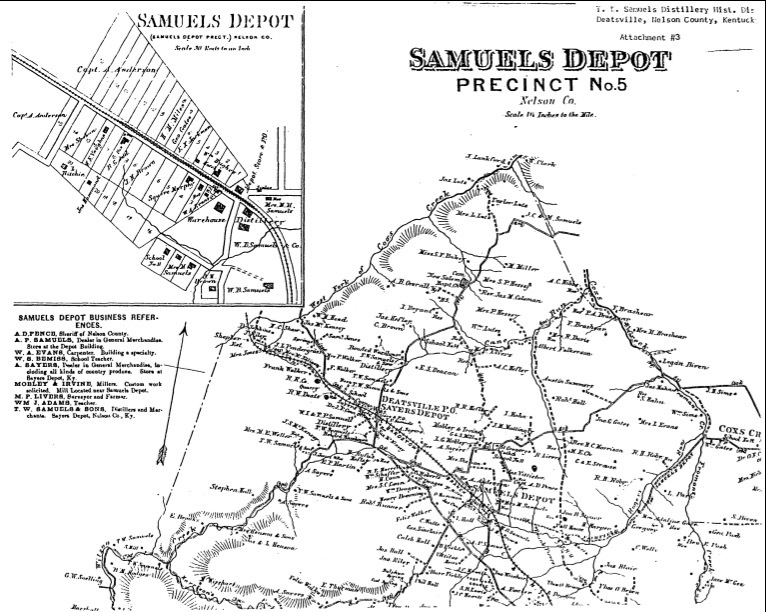 Samuels & Co. distillery in 1869, located at Samuels Depot on the L&N railroad, a stone’s throw away from the T.W. Samuels Distillery. Samuels Depot has other fame (or infamy) as the final hideout for Frank James before Sheriff T.W. Samuels arranged for him to surrender at the end of the Civil War. Decades later, a trio of cases from the early 1900’s – Edelen v. W. B. Samuels & Co., 31 Ky. L. Rptr. 731 (1907), T. M. Gilmore & Co. v. W. B. Samuels & Co., 135 Ky. 706 (1909), and W. B. Samuels & Co. v. T. M. Gilmore & Co., 142 Ky. 166 (1911) – tell the story of the demise of W.B. Samuels & Co. after W.B.’s death. W.B. died from typhoid fever in July 1902, at which time the stock in his company was transferred to his wife and his son. His wife and son continued to run the distillery, but apparently haphazardly. So in 1906, they agreed to sell their aging Bourbon, the distillery property, and the business itself, through a Louisville broker, T. M. Gilmore & Co. Despite the apparent truth that M. A. Samuels had been addicted to morphine for many years, and despite testimony from physicians of her mentally-weak condition, M. A. Samuels testified herself that “she knew and understood what she was doing” when she signed the contract with T. M. Gilmore & Co. As expected whenever a star witness contradicts the defense raised by her own attorneys, the court ruled in favor of the broker. The W.B. Samuels & Co. distillery was eventually sold and later was dismantled during Prohibition, never to return. Despite extensive searches in public online resources, I could not find any photographs of W.B. Samuels & Co. distillery or the man behind it, so if it weren’t for these lawsuits, the W.B. Samuels side of the family would have been completely lost to history, and we wouldn’t be able to contrast them with the rock-star side of the family. ← Distillery Slop – Bourbon’s First Environmental Challenge.